Stems: Leafless flowering stalk arising from bulb about 3 inches below ground, solitary, glabrous, waxy green. Leaves: Basal, 5 or 6, grass-like, sheathing base of flowering stalk, linear, 4 to 14 inches long, 1/12 to 1/8 inch wide, longer than flowering stalk, glabrous, folded somewhat. Inflorescences: Umbel, 2-9-flowered, terminal; subtending spathe bracts 3, lanceolate, membranous; flower stalks erect to spreading, .4 to .8 inch long, usually shorter than flowers. Flowers: Fragrant; perianth funnel-shaped, .72 to 1.2 inches long, bright to pale blue, 6-lobed; lobes united below, separated in upper half and spreading or ascending, oblong; stamens 6; filaments partially united to form tube; stigma 3-cleft. Fruits: Capsule, nearly spherical to egg-shaped, 2/5 to 3/5 inch long, 3-angled; seeds flattened, about 1/3 inch long, slightly wrinkled, black. Habitat: Prairies, grassy slopes, frequently in rocky areas. 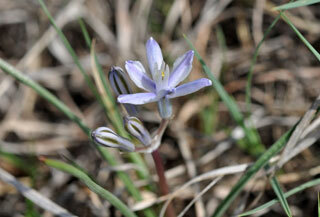 Comments: Blue funnel-lily is often hidden among the grasses of the previous season. From Greekandros "man" and stephanos "crown" alluding to the shape of the corona.